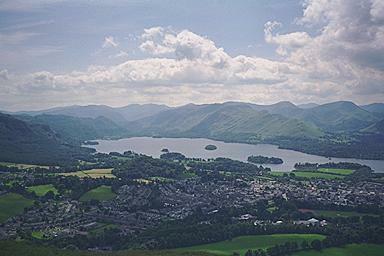 Latrigg is a popular destination for tourists visiting Keswick; understandable with a view like this. On the horizon, from the left: Bowfell, Glaramara, Esk Pike; the gap of Esk Hause; Great End, Scafell Pike, Scafell; the Gap of Styhead; Great Gable, High Spy, Dale Head; the gap of Hindscarth Edge; Hindscarth; the gap of Littledale (with Pillar in the background); Robinson, High Stile. Grange Fell is seen in front of Glaramara, and Catbells below Hindscarth Edge. Larger version of this picture.